SSD storage has finally arrived at mid range laptops. We're not talking about your typical 16/32 GB units that have been around for awhile now. No, we're talking about true SSD storage, where you can actually, you know, store stuff. Such is the case of the Asus VivoBook E403SA-US21, one of the most impressive mid-level laptops we've seen so far, that comes packed with 128GB SSD storage, amongst many other virtues. In our review of the Asus VivoBook E403SA-US21 we'll explore its Full HD display, quad core processor, spectacular build and essentially why this laptop is worth every penny (even if it doesn't cost that much to begin with) in excruciating detail. Ready to tag along for the ride? What are people saying about this laptop? Check it out here! At first you might be pushed to see this laptop because you're impressed by the inclusion of a Full HD display on a moderately priced laptop. However, there's so much more to the Asus VivoBook E403SA-US21 than its display. The design is quite simply flawless. Not only is it light (3.3 pounds) and thin (0.7 inches) but also the build quality is comparable to that of the high end laptops in the market for fraction of the price (ejem..ejem..Apple). Its aluminium finish not only gives you a premium feel and a firm grip but it's also great when keeping the laptop cool. Also, even though it's a very compact model, Asus still made room for a very comfortable keyboard and a very sensitive trackpad. Now about that screen...The Asus VivoBook E403SA-US21 comes packing a 14 inch Full HD display that delivers an incredibly crisp image compared to the industry standard (1366 by 768). Also, since it's actually 1.6 inches smaller than the standard, you get even more pixels per inch than its Full HD 15 inch counterparts. But is performance any good? Do you really think Asus would've spent so much time, money and energy developing a paperweight? Sure, on paper it doesn't really sound like much and we're not gonna lie to you and tell you that its Celeron processor does the same as a Core i5 because that's simply not the case. You know what really helps performance on the Asus VivoBook E403SA-US21? Its storage. The 128GB of SSD storage on this unit make all the difference in the world for real life usage. Benchmarks aside, a faster storage affects pretty much everything on your laptops performance, this set of specs on a hard drive wouldn't be worth much but because we've got ample SSD storage, average computing tasks are hardly a challenge. That said, the processor is still Intel's latest entry level CPU. Specifically, we've got a Braswell, Intel Celeron N3700 quad core processor that works at a standard base frequency of 1.6 GHz and extends its processing speed to 2.4 GHz once we become really demanding. Add to that 4GB of RAM as well as the previously mentioned storage and you've got yourself a great laptop to surf the web, edit documents, edit your favourite pics and stream Full HD movies without breaking a sweat. We're not gonna say this is your ideal notebook if you want to get hot and heavy with Photoshop everyday but for your average tasks it's quick and efficient. 14 hours of battery life? Can I play games? It pains me to say that gamers should look elsewhere when picking a laptop because despite its beautiful screen ideal for watching movies this laptop simply does not have what it takes to deliver a good gaming experience. As in, there's no dedicated graphics chip. So gaming is just a non-starter. 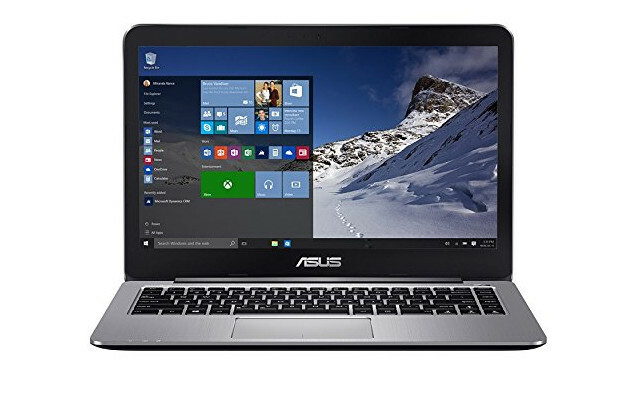 However, for those of us who aren't pc gamers, the Asus VivoBook E403SA-US21 provides a very attractive feature; an outstanding battery life of up to 14 hours of battery life. To put this into some perspective, most mid range laptops can't go beyond the 6 hour barrier and even Apple's beloved 13 inch MacBook Air can't reach this level of battery life staying in a distant second place with 12 hours of battery life. If performance were sub-par battery life would be irrelevant, but when performance is good for everyday "computing chores" battery life is a huge plus. Add to that an extremely portable design and it's lightweight body and you've got yourself the go-to laptop for both students and office workers on the go who don't wanna worry about having to carry around an annoying (and heavy) power cord everywhere they go. If you follow Apple you'll know that the company came under intense scrutiny when they launched the MacBook with a single USB Type-C port. They were right on the money when they said USB Type-C will be a big deal but they were wrong to include this port as the ONLY port. Asus decided not to make that mistake and while the company did deliver a USB Type-C port on its Asus VivoBook E403SA-US21, it also cared enough to add an SD card reader, USB 3.0 port, a USB 2.0 port, HDMI port, audio combo as well as a separate charging port. This is what Apple should've done in the first place as it's the best of both worlds. Speaking of new industry standards, Asus's latest signature edition laptop also comes equipped with WiFi ac support, which means that (with a compatible ac router) you'll be able to reach download speeds up to three times faster than the conventional b/g/n antennas you'll find on most laptops in this price range. Finally, this is a laptop where the first thing you'll do upon turning it on won't be to uninstall programs since its a signature edition model which means it comes with a clean cut version of Windows 10 (sans the annoying bloatware no one wants). In Conclusion; Is it worth it? Our Asus VivoBook E403SA-US21 review has not only proved that this laptop is worth every penny but it also redefined the market as to what we should expect from a low to mid range laptop. No longer should we just settle for a Celeron processor, HD screen and a Hard Drive. There are much better alternatives in the market, with much more to offer at an exceptionally competitive price. This laptop isn't a powerhouse when it comes to brute force. It's not designed for gamers or "powerusers" who need to run dozens of programs at a time. But for the average user, the one that's just looking for a laptop to watch movies, talk to friends, edit pics and so forth this notebook means they no longer need to either get a bad laptop or a mid range laptop above what they're willing to spend. Asus has shown us that they can find a point in the middle where the average user can finally get the best of both worlds and not lose an arm and a leg in the process. For that kind of user, this laptop is match made in PC heaven.